Geoff did come home last night. My ears are still ringing from Maria's scream of joy when Geoff's key turned in the door. He goes back to work today, but we had an evening full of laughs and catching up. Everyone slept in... bliss. We had a big breakfast... muchas gracias chicas. We even did a little cleaning. I now have a Portrait of each chica in the nest box. 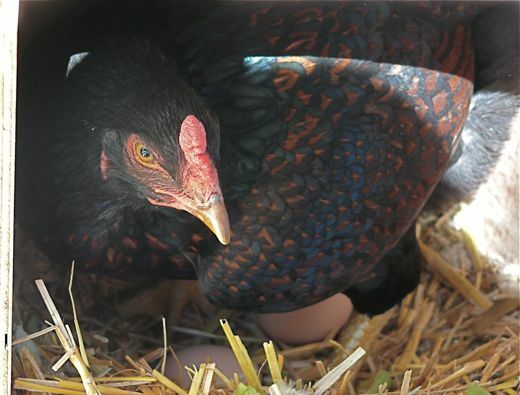 It is such a reverent and solemn time when they are laying. They get calm, dare I say introspective? I don't mean to anthropomorphize too much, but they are like women in labor, quiet, intent and focused. Sometimes they hum or coo or making an almost purring like rumble. They fuss with the straw, turn, shift and turn again. 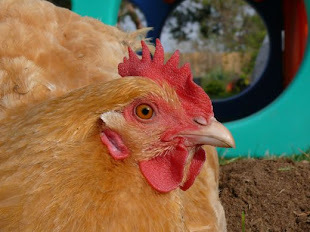 Frida is such a serious little hen. She is the smallest and the most intense. Cranky really. 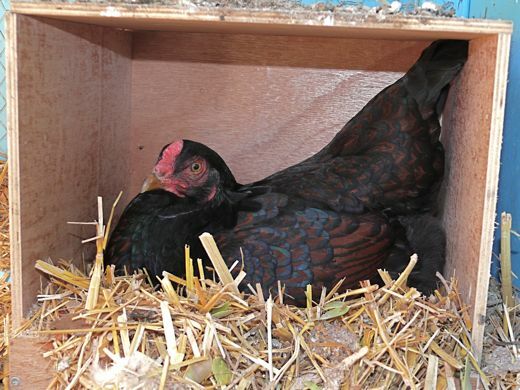 But since she has started laying she has settled a bit and seems more tolerant of my doting attention. I am glad they let me sit beside them and visit. 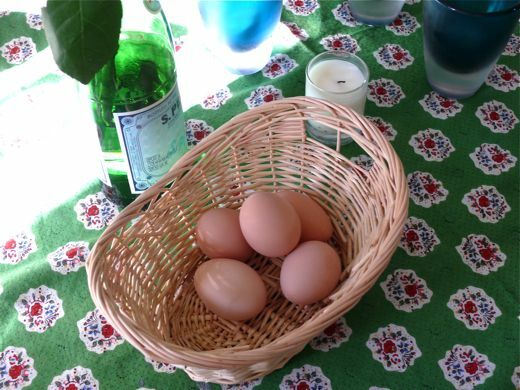 Frida's eggs are the lightest color of the three. Her eggs are almost pink and they are completely covered in pinpoint white flecks. You'd almost expect to find strawberry cream inside. The chicas are easier to catch, but not necessarily easy to catch. They seem to have adopted me as the rooster (flattering) and they will assume the position when I happen by. Alex did not get cooperation when he went to pick up Betty. 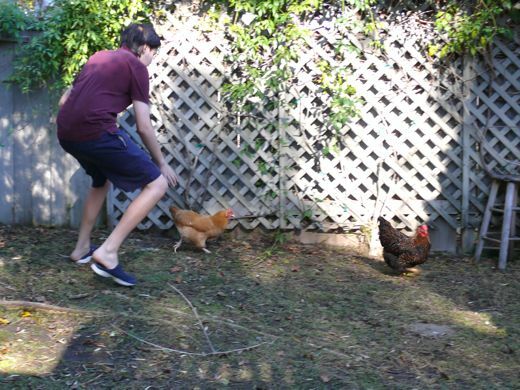 So, he started his morning with an invigorating chicken run. Maybe it's a good thing our backyard is a postage stamp. Alex held Fantam for a few minutes, and I got a little misty eyed recalling when he had our first hens and he was a much younger, smaller farmer. 6 years ago... whoa, the math, the time, the changes. How does this happen? Sigh. June 7, 2003. Alex and Gracie. Just above the table coop, in the branches of the ficus tree, is a hummingbird's nest. She flits and calls above my head every time I visit the chicas. Then she settles in to the egg cup sized nest that is expertly fixed on a slender branch. As small as she is, her tail hangs down and her head and slim beak can be seen alertly poised above her nest. I imagine her, and the nest could fit securely in my palm. Even after our big breakfast we still have a store of eggs. They are pretty. When we find them in the nest box they are warm to the touch. Seeing them sitting in the basket, lovely shades of café con leche, I sigh happily. Birds are not the only ones that nest. I try very hard to overcome my longing to fluff feathers and pull straw in my own home, and resolve to make this house as homey as possible. Even now I am cranky and sad thinking of what I wish I could do, thinking of what I miss about our Rancho days. 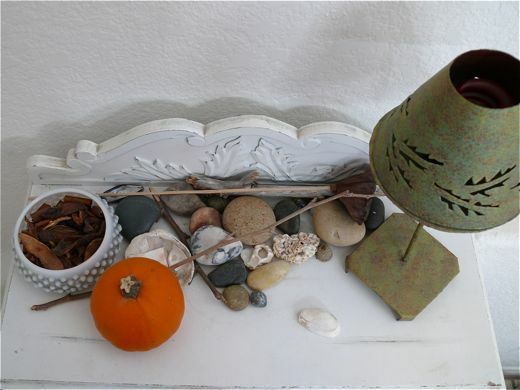 Seashells and pumpkins, sticks and stones. We live in a rich environment, in a land of opportunity, and our nest is well lined and snug. In years to come I wonder if I will read this and remember the horrible wallpaper or that the handle to the oven fell off, for the fourth time this month. I hope I remember that Maria and I watched dolphins in the reef, during one of the most pacific days on the Pacific I have ever seen. 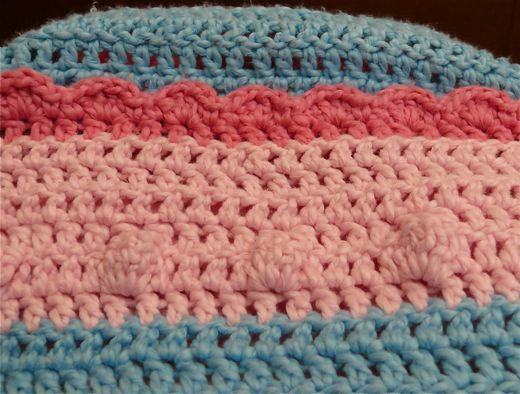 I very quickly finished the pink and blue crocheted blanket... the one I had to rework a bit. I love it. Everybody loves it. It has such a wonderful texture and feels warm, almost like a firm hug, when it's on top of you. I promised my Mom pictures of the popcorn row and shell edge I added to the top of the blanket. The popcorn effect doesn't show too well, but it's a row of bumps that are whimsical and fun. 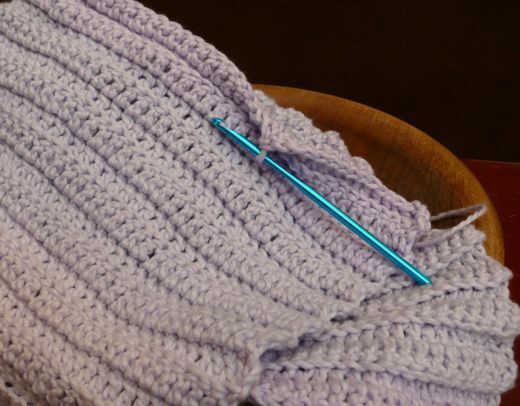 I was so anxious to finish the blanket... anxious as though I were bored of the project and the frenzied pace I was working at, but as soon as it was done what do you think I did? Yes, I started another one. This one is cotton too and it's lilac. I messed around with the stitch and made a pattern that reminds me of a garden bed with raised rows ready for seeds. I will call the blanket Lavender Fields. 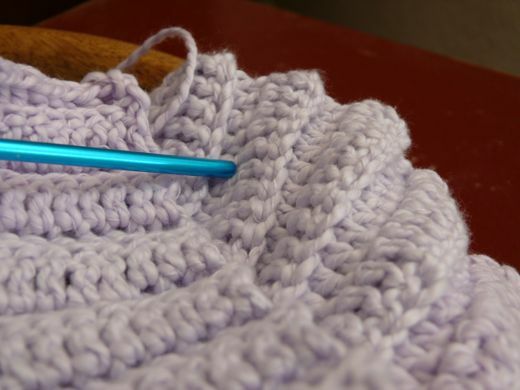 Probably this stitch has an original name, but I don't know it from any of the other stitches I make up, so Imagine it is all mine. This one feels good too. Heavy and comforting. I don't know how big I will make it, but I am trying to remember to slow down and enjoy the process. How could I ever think I was bored making the first one, when all I wanted to do was make another? I think I would be one of those birds that makes a new nest every year, which is funny considering I am so piney for a forever home. Maybe I will settle in to our own house and be desperate to move in 5 years... but I don't care. I'll cross that creek when I get to it. Wow, I've never seen a hummingbird nest before. They don't look like any other bird nests I'm familiar with. We had a hummingbird nest in a tree in the courtyard of a building I use to work in. After the eggs were laid everyone tiptoed around. When they hatched, we couldn't take enough breaks to look at the babies, and when they finally left, we were all sad, but richer for being involved daily with the progress. The momma bird was calm, even with all the people who had to 'see'. It was a wonderful experience. Thanks for bringing back the memory of that lovely spring. The hummingbirds in these parts are so fierce. They'll hang out within a few feet of your face, watching you. They'll buzz your head if they don't want you around. I love them. I laughed reading the part about your chicas "assuming the position". My chicken girls do that to me as well. We hope to find a good rooster at the livestock show this month, who will protect them from being pestered by the geese. No real harm done thus far, but we want to keep it that way, know what I mean? Wow... I think you are very lucky to have found a hummingbird's nest! I haven't ever seen one although we have tons of hummers around here in the summertime. Alex is so cute, six years ago, and today...! How exciting to have found a hummers nest. I see them around but have never found a nest. 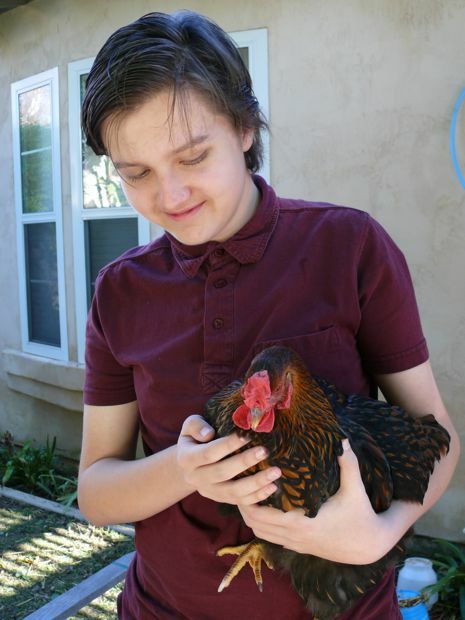 I love reading your blog and about your chickens. I hope to get some soon. Maybe after sll of this cold weather goes away. We plan to srart building our coop soon. Hummingbirds are so cool! I never saw one in its nest before. I think you will remember the essence of it all because you are living consciously. 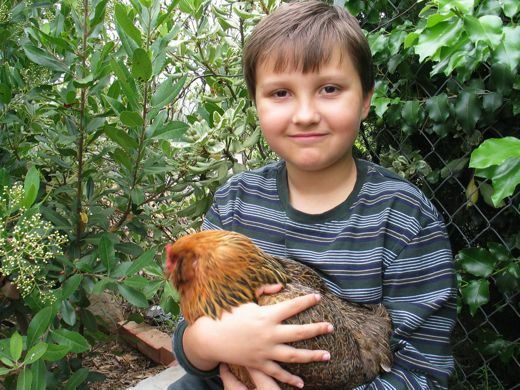 I do enjoy this little glimpse of your life with children and chickens! If you have hummingbirds in your yard, pay special attention in the end of June and early July to see if there are any young birds that do not fly very well. This is a sign that there is a hummingbird nest in your area. Chances are you will never find a hummingbird nest, even if it is in your own back yard. 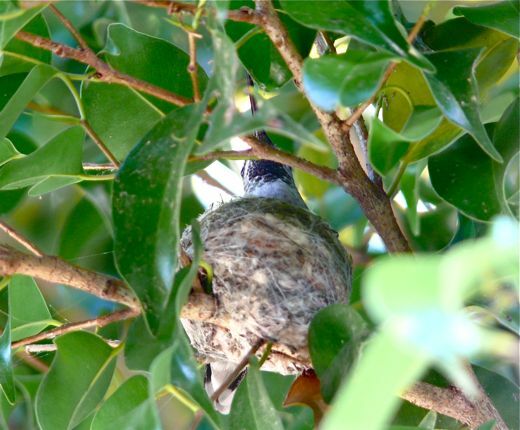 Maybe the information given above will help improve your chances of spotting a hummingbird nest. Oh, to be running around in shorts! oooh. I have never seen a hummingbird nest. Hoping you're feeling all better! I'm going to bed early, so I can get up to see every band in the parade. Yes, I'm delirious! Love the hummingbird nest. I think it's a sign.